Notifying your site visitors of replies to their comments on your posts is a super way to keep engagement high on your site. The Lightweight Subscribe to Comments plugin is easy to configure and get started with comment subscriptions. Discover the feature list and recommended settings I use in this quick tutorial. There’s a written tutorial with screenshots below the video too. For those who prefer to read or just see screenshots for reference. Is this the right plugin for me? Before you install Lightweight Subscribe to Comments, be sure to check my in-depth plugin comparison post to see the pros and cons of all currently supported plugins of this type. In that post, you’ll see that I advise that the Lightweight Subscribe to Comments plugin is best suited to sites with 15 or fewer comments per post. It’s an all or nothing type subscription, meaning that commenters are subscribed to all replies, not to just those on their comment. But, this plugin has a couple of super features not found on more complex plugins, like only showing an excerpt of new comments in the emails a subscriber receives, which can really bump up repeat visits to your site. Another stellar feature is a fully customizable thank you email for first time commenters. One of the super features of this plugin is that it fixed a HUGE issue with the older Comment Notifier plugin, which allowed spammers to be subscribed even if their comment was never approved. Once you install the plugin, you’ll find a link to configure it under the Settings admin tab. All of the settings are on this one page, so it’s super quick and easy to configure everything. Email Management – this allows you, as the admin, to remove an email from the subscription list. It removes them from all posts they are subscribed to, so be careful with how you use this. Enable The Checkbox – of course you want this on so that the checkbox for folks to subscribe is available. Checkbox Label – this is the default message beside the checkbox. You can customize it. Checkbox Default Status – I would suggest you leave the checkbox checked by default. If folks don’t want to subscribe they can uncheck it. This is how the checkbox and message might appear on your site, depending on your theme’s styling. From name – This will auto populate with the title of your site. You can leave it at that, or shorten it up if needed. You just want to ensure folks instantly recognize who sent them the reply notification email. From email – this will auto populate with the default email in your WordPress settings. Keep in mind that commenters will be able to see this, so change it if you need to. Subject – The default setting includes tags with the commenter’s name and the title of the post. Since it’s not likely that subscribers will recognize the name of another commenter’s reply, other than you, and because some email clients shorten the subject link, you may want to consider changing this up a bit. Maybe something like “There’s a new comment on” and then the title tag. So, if the subject line gets cut off, at least the most recognizable part of the first of the post title will be shown. You can fully customize the message your subscribers receive, and there are ample tags to help auto populate that message. There is no rich text editor available. So if you want to include more text or links, you’ll need to hard code them in html. The notification emails this plugin sends are super nice looking. Above is an example from tests run on this plugin. This allows you to control how much of the comment reply is sent in the email. My 20+ testers preferred it to be set around 300 characters, so they had enough of the comment to get the gist of it, but still needed to return to the site to see the whole thing. This plugin feature will likely generate more repeat site visits and longer time on site for you, both of which are SEO ranking factors. This next set of settings are for commenters who wish to unsubscribe for receiving comment reply notifications. If you choose to create your own page, input the full URL path to it in the Unsubscribe Page URL field. 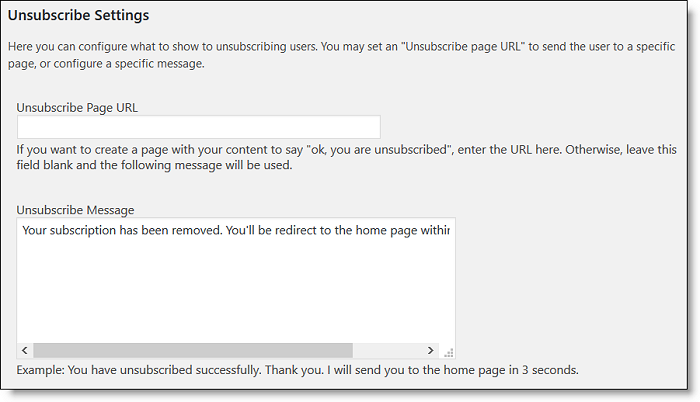 If you want to simply customize the Unsubscribe Message, do so, and leave the Unsubscribe Page URL field blank. 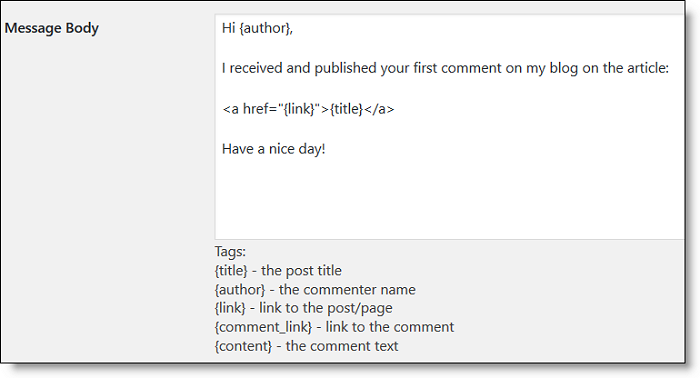 One of the nicest features of this plugin is the ability to send a special Thank You message to first time commenters. It’s a great way to promote more of your content, social media links, and offers. Check this box to turn on the ability to send the thank you message. You want to be pretty straight forward with this email subject line so that it doesn’t get caught in any spam filters. There are two tags you can use too. I would suggest using the title tag so that it will remind them which post they left a comment on. You can fully customize the message of the email they will receive. There are also several tags that can be used to auto-populate the message. And honestly, I’d dress this up a bit, as it’s pretty dry. Maybe at least say thank you for leaving a comment or such. If you want to include more of your own content links, or social media or such, you’ll need to hard code them in HTML, as there is no rich text editor. If the checkbox is not appearing where you would like it to, try turning this function on to see if that helps. Otherwise, you may need to contact your designer for some styling help. The first setting is for where to send a copy of each email, in case you want to track that. Most folks won’t need to. The next one is an email address of where to send test emails. I’d input that one, so you can preview all emails before visitors get a chance to see them. That’s especially true if you added any custom coding. I believe checking this box will disable your theme’s CSS styles from being added to the plugin’s checkbox. So, if you have any layout or style issues, try checking this to see if it helps. Otherwise, you may need to contact your designer for some styling help. On my test site, I checked this box and then looked for orphaned files and database tables. It doesn’t clean everything out as well as it claims. Once you’ve completed all of your settings, try sending yourself a test of the thank you email, if you chose to send that. And then be sure to Save all of your settings. Once visitors start leaving comments on your posts, you’ll begin to see this last section populated with their info. While there isn’t much help for filtering or sorting the info, at least you can see the latest ones at the top. 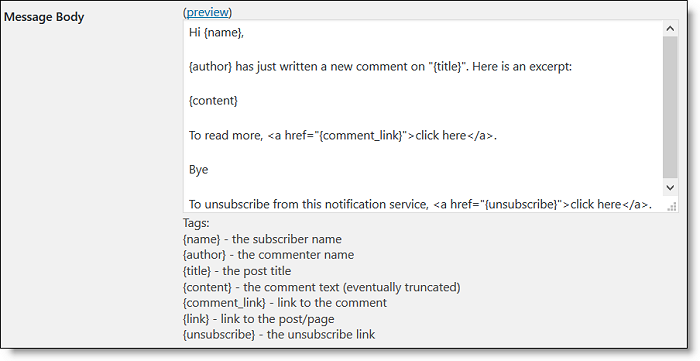 I hope you’ve enjoyed this tutorial on the Lightweight Subscribe to Comments plugin. Be sure to subscribe to the BlogAid YouTube Channel for more helpful tutorials.